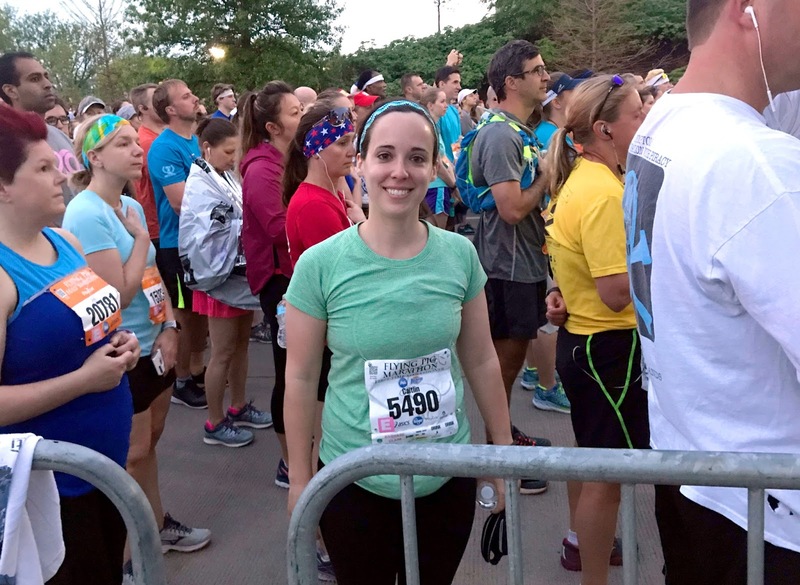 I ran a marathon! 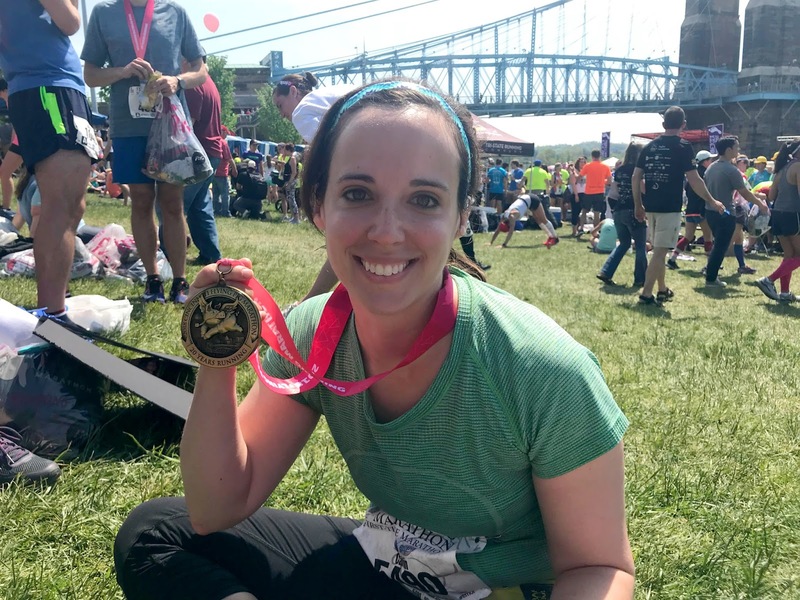 I finished the Cincinnati Flying Pig Marathon in 4 hours, 37 minutes, and 43 seconds. I am so proud, so happy with how the race went, and so thrilled with my time! Back in October, I started training on my own, and then in January I joined a local running group. I ambitiously joined the pace group training for a 4:30 to 4:45 marathon finish time (about 10:18-10:50 min/mile pace), which was a bit faster than my half marathon pace of 11:12 min/mile. All winter and spring I ran two shorter runs during the week and one long run on Saturdays at 7:30 am. I am so glad to be done with those early morning weekend runs, but so glad that all my hard work paid off! 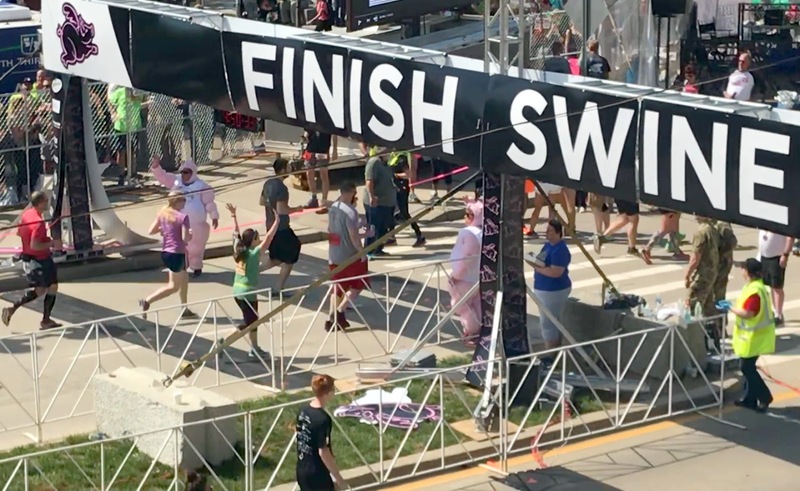 The "Flying Pig" moniker of the marathon is a nod to Cincinnati's history in the meatpacking industry and the city's nickname of "Porkopolis." As a lover of puns, I appreciate how the race organizers fully embrace the porcine theme. You'll see what I mean as you read my thoughts from race day in my "piggy tale" below. Pre-race: Dan and I wake up at 4:15 and he drops me off downtown at 5:30. I make a quick pit stop at the port-o-lets and then meet up with my group outside the Cincinnati Bengals football stadium before we head into our "Pig Pen" (corral). Dan surprises me at my pen to wish me luck! Mile 1: Hyperventillating. So excited/anxious. Miles 2-3: One bridge down and I'm in Kentucky! It always feels cool to run into a different state. I realize so much anxiety is already melting away... it's race day and I'm not sick or injured! Miles 4-5: Done with all three bridges, and we're back into Cincinnati! I see Dan, Jen, and Jeff for the first of many times! Miles 6-9: Hillllllls. This is what I trained for! A guy holding a big pink letter "F" deadpans into his megaphone, "Get the F up the hill." I jump up to touch the Mario question mark boxes that a spectator is holding over the course. Elvis serenades us with his most famous song, "Sweet Caroline." I separate from the rest of my pace group and our coach Eric becomes my personal pacer for the next 12 miles. Miles 9-11: Rolling hills. So excited to see Dan, Mae, and GranE! I give smiley Mae a big hug, but she bursts into tears after I leave. Oops. I see Jen, Ben, Anna, Joey, and Lisa a little further down the road. Miles 12-16: Still feeling pretty good through the residential area of Mariemont. The decorations, spectators, signs, and snacks are better here than anywhere else along the course! Pig balloons... crepe paper... pink everywhere! I skip the bacon station(!! ), but accept a blue popsicle from a little kid. Lots of kid high-fives through here. I turn on my music and iTunes selects "Eye of the Tiger" as the first song. Good choice, iPhone. Miles 17-20: Starting to get a little overheated and slow down a bit... but I'm still running!! That thought keeps me going as the cloud cover evaporates and the sun beats down my back. Eric has pulled ahead of me, but I know if I stop just once I will stop again and again. I'm taking every opportunity to cool off: dumping at least 2 cups of water down my back or over my face at every mile and filling my shirt with ice from the medical tents. (The rattling sound as I jog along is kind of funny). I feel like I'm wearing a wetsuit. The 4:30 pacer passes me. My phone plays "We Are The Champions." Too soon. Miles 21-23: I'm tired, but still feeling good! I airball my Layup for Lauren at 22 miles. Basketball was never my strong suit. (Then again, neither is running.) I hit 23 miles and realize there's only 3 more to go!!! Mile 26.2: The longest mile of my life, but PACKED with fans! A guy with blue hair running next to me encourages the spectators to cheer for me. Lots of crowd support! Dan videos me crossing the "finish swine!" Post-race: I stumble through the exit chute and babble something totally incoherent to a medic who helps me pour water over my head and gets me a foil blanket. I continue on and collect my medal, a fruit cup, and a banana. I enter the recovery area at Smale Park and OH MY LEGS HURT. All semblance of balance and coordination is gone. Dan meets me and helps me wobble to a grassy area so I can sit down while he collects my finisher jacket. Finally, after several minutes, I muster the energy to struggle up 2 flights of stairs and 5 blocks of city sidewalks to the parking garage. After we get home, I shower and lay in the bath tub while Dan picks up a cheeseburger, fries, and mac & cheese for my recovery meal. I can barely move; according to my Fibit, I have taken over 56,000 steps! I finish the evening with a delicious pasta dinner and the cutest flying pig cookie that Jen gave me! I also open a gift from Mom and Dad: a flying pig bracelet charm marked 26.2! I am proud, happy, and exhausted. The pig-themed snack/aid stations: Flying Fish Station (offering Swedish Fish), Twist & Snout (Twizzlers), Pig Tails (gummy worms), Swine & Cheese (Cheez-Its), Greased Pig (Vaseline for chafing), and many more! Running past a guy in a shark costume around mile 17. 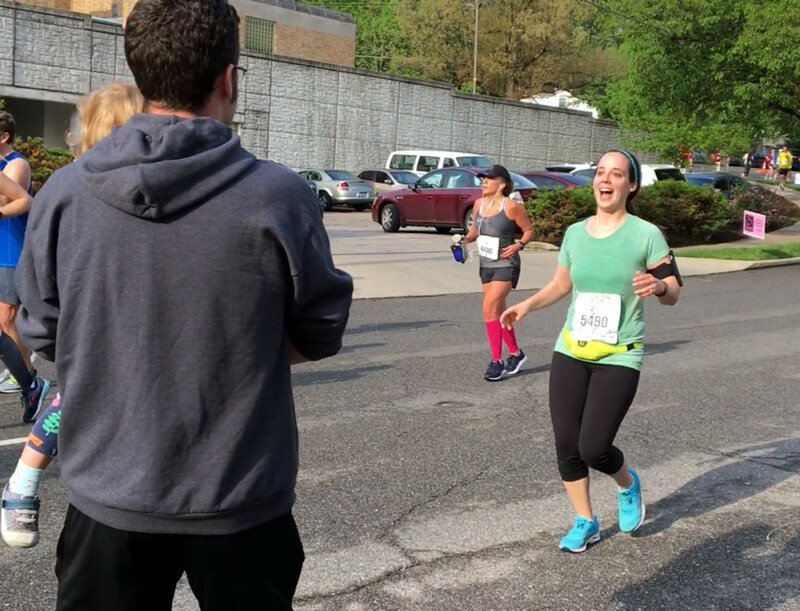 Weeks before the race, Dan told me not to be discouraged if I was struggling late in the race and got passed by someone in a ridiculous costume. So, I almost laughed when I was the one passing the shark! I shouted, "Go shark!" and he gave me a thumbs up. Silly spectator signs... Santa and the Easter Bunny were there holding up signs that said, "I believe in you!" and lots of people had signs said "I like PIG butts, and I cannot lie." I must give a HUGE thank you to Dan for supporting me through all this. When I started training, I knew this would be a big commitment, but I did not fully appreciate just how much time it would take. Every Tuesday and Thursday after work, I was out running until past Mae's bedtime, and Dan was at home feeding, entertaining, and bathing Mae and putting her to sleep. He was up early with her every Saturday morning, finding fun activities to keep that busy little girl happy. He cleaned up the house and washed dishes when I was too tired or sore to rally myself. He suffered through all my anxious tears and encouraged me after every difficult training run. He let me have the bed to myself for two nights leading up to the race so I could toss and turn as much as I wanted. 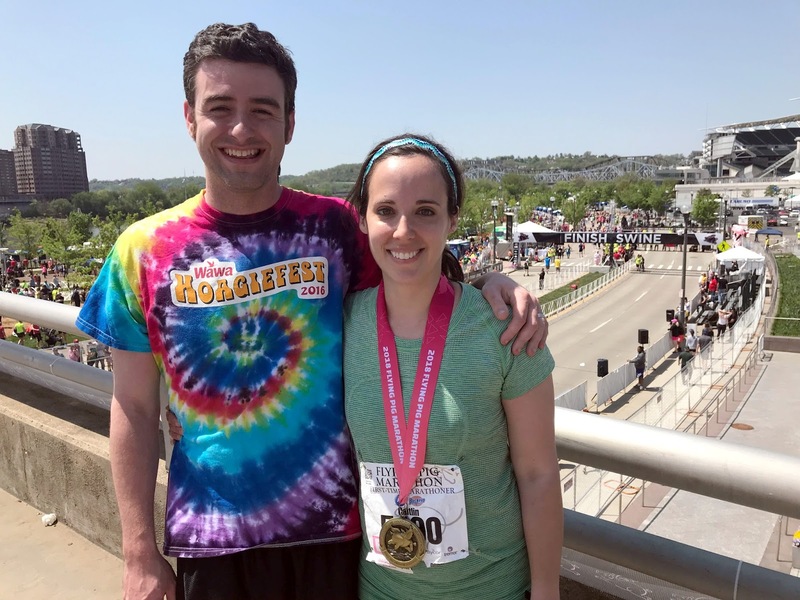 He woke up before the crack of dawn to get my to the starting line, followed me all over the course to cheer, and wore his brightest shirt so I could find him easily among the spectators. His emotional support before the race (and physical support afterwards) was the main reason I was able to accomplish this goal. Thank you, Dan!! Now, here's some fun statistics. The Flying Pig has a reputation for being quite hilly, and it was certainly no walk in the park. 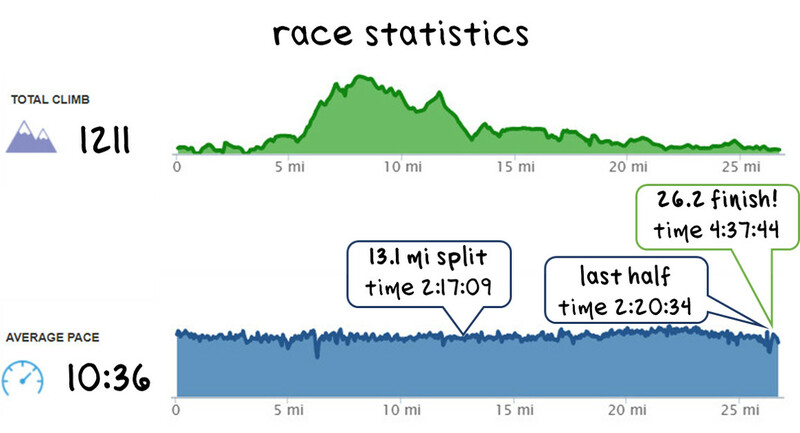 However, the total climb of 1,211 feet was nothing compared to my half marathon total climb of 1,641 feet! 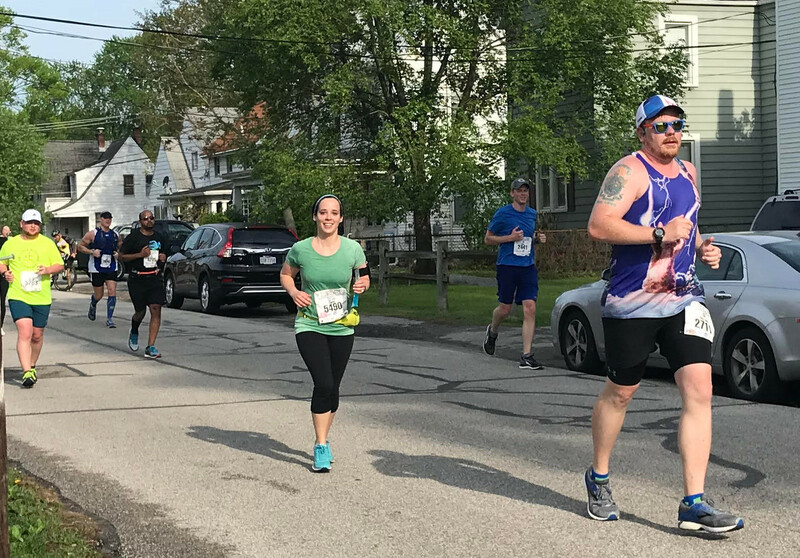 I kept a pretty steady pace throughout the event, slowing a bit around mile 20 and getting my second wind around mile 24. 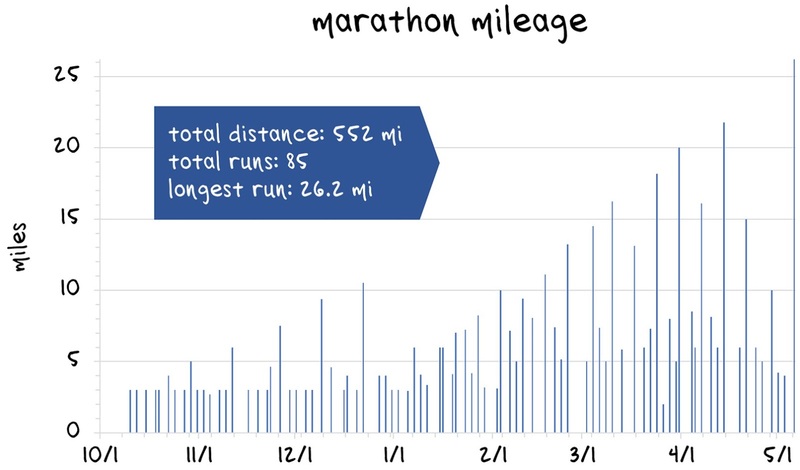 I completed just over 550 miles between training and race day. My peak week was around 36 miles. I think it's time for a new pair of running shoes! Lastly, I'll wrap up with my favorite inspirational quote that I saw on a spectator's sign: "Pain is temporary, but posting this on Facebook is forever." SOO proud of you, Caitlin!!! What an accomplishment! Thank you! I am so happy I finished it (and so glad it's over)!